Not the sugared bubbles with caffeine that tickle my nose kind. We did have plenty of caffeine to stoke our 12 hour firing schedule, and sugary donut holes that accompanied the coffee to wake us up way too early from the Sunday morning slumber. This past Sunday, I, along with 10 other potters, participated in a Soda Fire Workshop at ClaySpace with step-by-step instruction from John Spiteri. 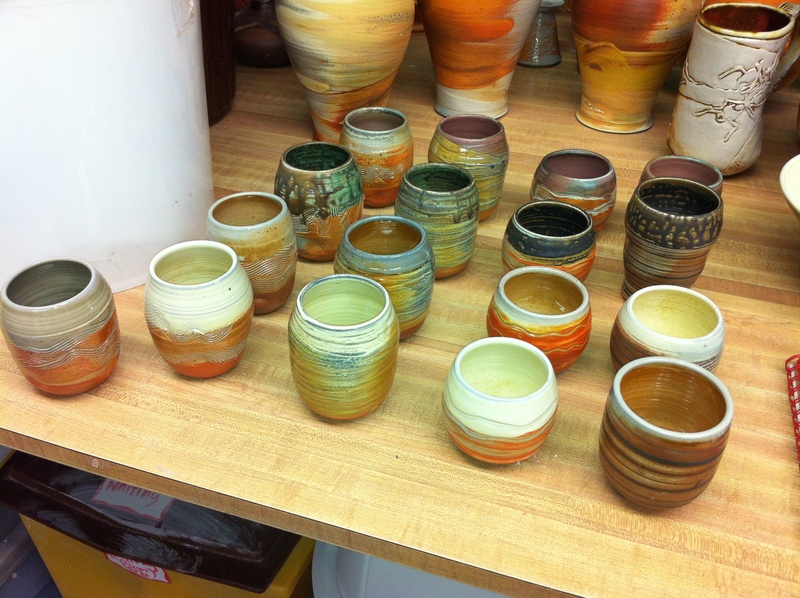 While the actual firing was for 12 hours on Sunday, there were weeks of preparation—mixing the slips for testing, making and applying the slips to the pots, firing to bisque, apply glazes and finally the loading the kiln. All in all, we had about 3 months to prepare the 12 hours of watching the kiln burn to 2330 f, measuring its progress every 30 min and eagerly waiting the 3 days for the kiln to cool just enough to handle the pots with heat-proof gloves. The results… OMG! Some cry, some cheer, some just stand speechless staring at a piece of clay that speaks volumes. It really is as much a guessing game, a gamble of what you will see when the kiln opens. (By “open” we mean remove the bricks one by one as the anticipation of the crowd build.) If you are a control freak, start soda firing and you will be cured. If you live serendipitously, you will be in your happy place. There’s something for everyone. Whether you are a potter, or a collector of pottery, you will be hooked. There is so much written about soda firing out there, I’m just going to post the words found from my research that helped me the most. Emily Murphy: Super helpful blog post about soda firing complete with history, process, photos and recipes. Gail Nichols: She is an Australian ceramic artist, recognized internationally for her innovative approach to soda glazing. We used some of her slip recipes to test its magic. John Spiteri: Of course our instructor! In my own words, he has gazillion years of experience as a potter who have set his feet back down to help aspiring potters like me. Ceramic Arts Daily: An on-line newsletter format with loads of useful information about pottery making. And then there’s the Google search for “soda fired pottery”. There’s no right way or a wrong way to soda firing except for the process. You put the pots in the kiln, cross your fingers, say a prayer if you’re the praying type, and wait patiently or impatiently as it may be. What’s next? Another soda firing!